Look, a new Minecraft mob! A secret new Minecraft mob yet to be placed in the game, but accessible by fiddling with the latest version snapshot. 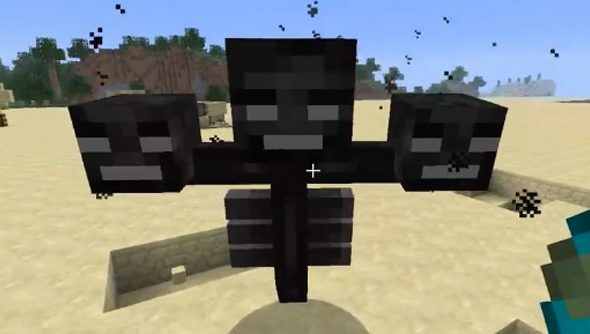 A secret new Minecraft mob called the Wither Boss who floats around chucking festering, withering, exploding skulls at you, your friends and your pets. Coming to a Minecraft update near you soon. I have mixed feelings about this. Helpful Reddit user SethBling has provided a world download with the Wither Boss in it, though you’ll need to be running the latest Minecraft snapshot and have some idea what you’re doing. I certainly don’t, so will be waiting patiently for this corrupted chap to come storming into the full game.